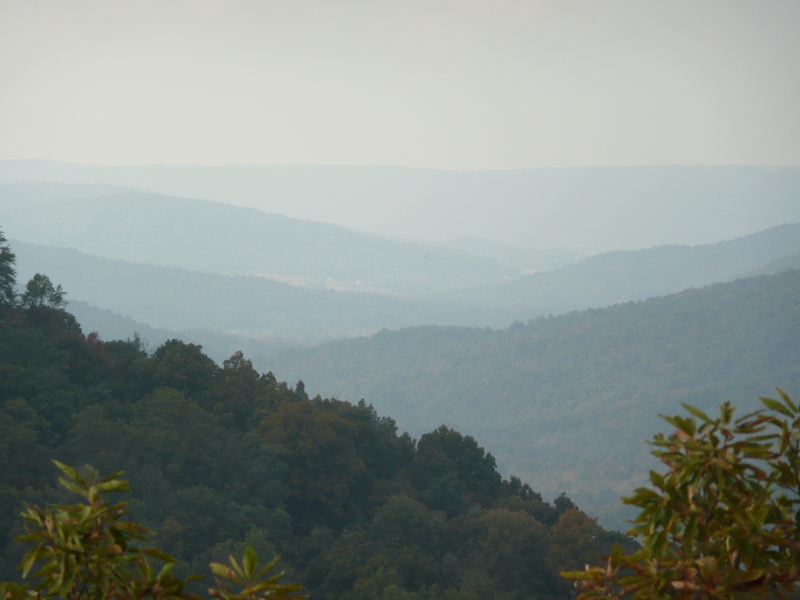 Though my goal had been to get to the Smoky Mountains, I never made it… but had great fun exploring the Cumberland Plateau instead. 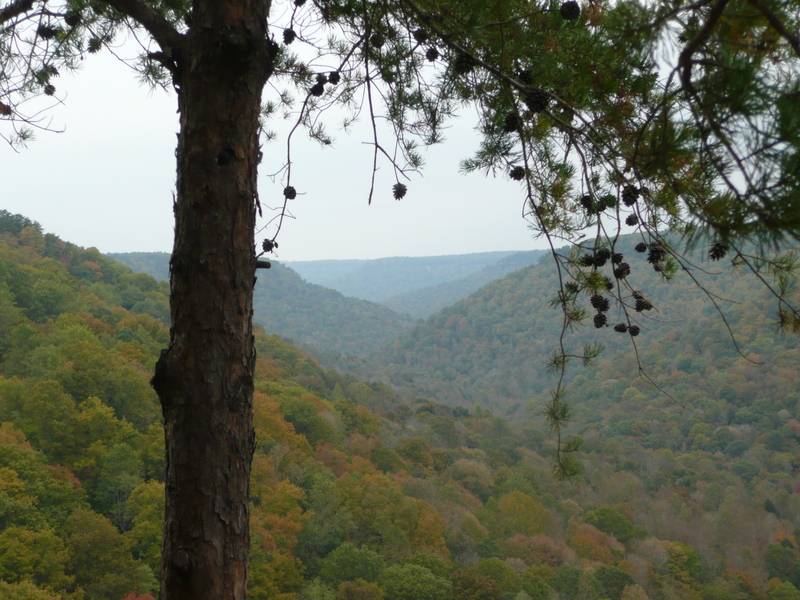 Covering much of central Tennessee, this plateau is nearly 1,000 feet above the height of the Cumberland River (to the southeast), and contains an incredible diversity of plant and animal species. 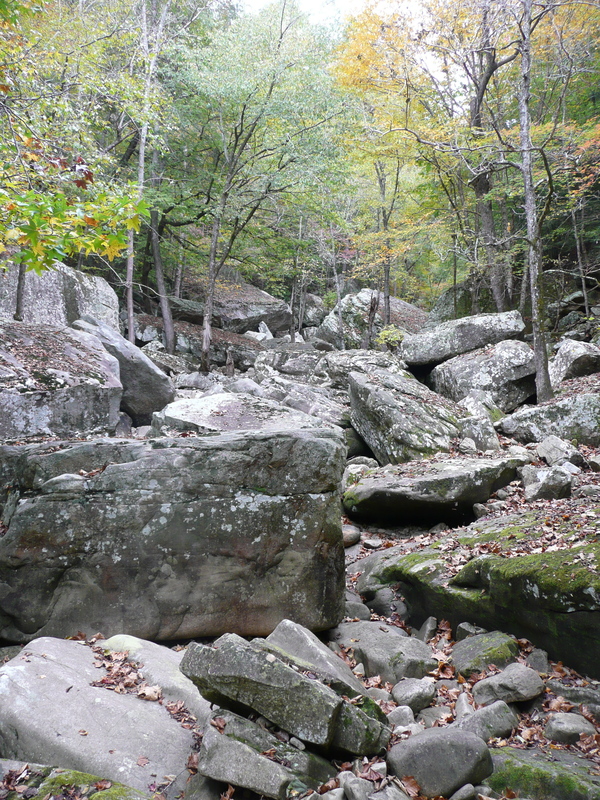 It has been carved over millenia by many creeks, and the geology of the area is apparent at every turn. 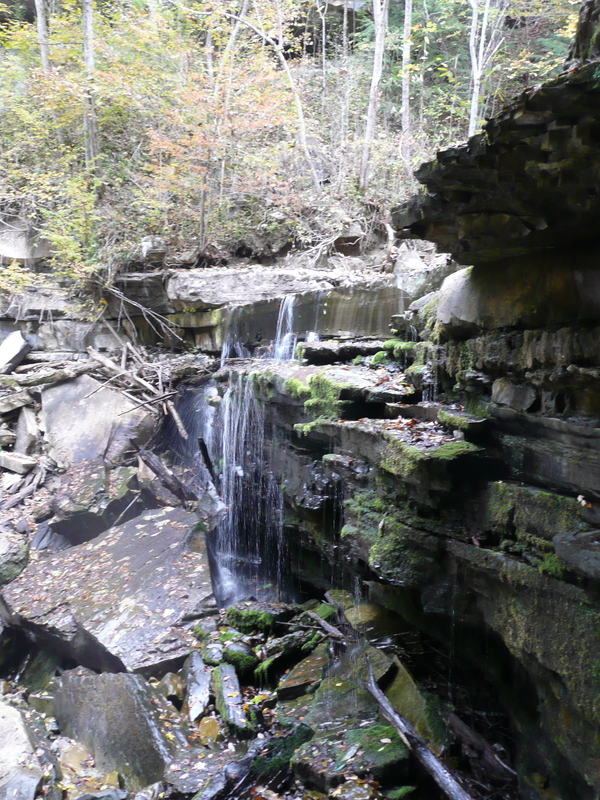 I decided to take a short backpacking trip (one night… though now I’m convinced to go back for more), and decided on the Collins Gulf sector of the Savage Gulf State Natural Area, which covers nearly 16,000 acres on the western edge of the Plateau. On a longer trip, I could have traversed the area, which is cut through by several rivers and creeks, giving it the aerial appearance of “a giant crowfoot.” If you are handy at reading a topographic map, you’ll find this one quite impressive. Despite the topography, I figured that a twelve-mile hike in one day was do-able, if potentially exhausting. The volunteer at the ranger station had told us that in the drought and late fall conditions, there was “no water” on the trail, so we packed in all we would need. It turned out that there was enough water to filter in several places, so I will do my research better next time. 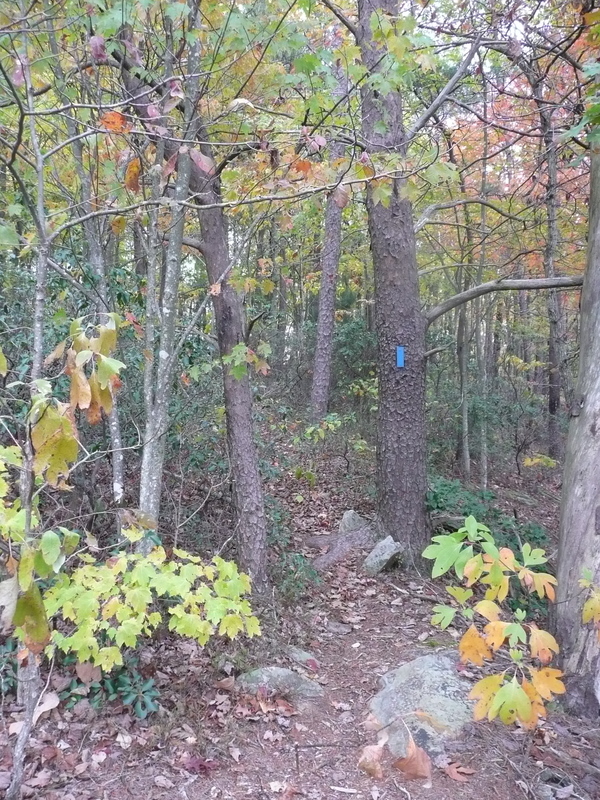 Twelve miles should have been do-able… if several sections of the trail hadn’t looked like this! 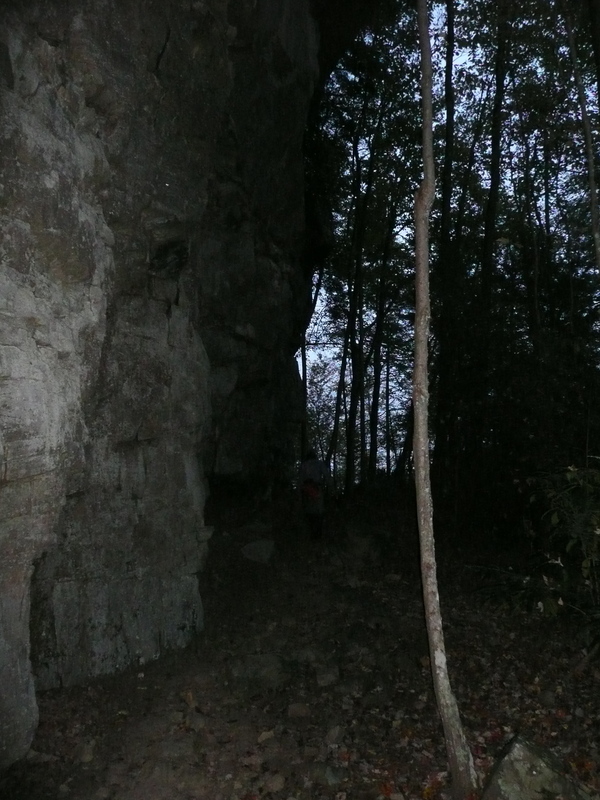 On several signs and in the park brochures, we were repeatedly admonished, “No hiking after dark.” Foolishly, I didn’t think much of it until we started encountering sections these rickety boulders! 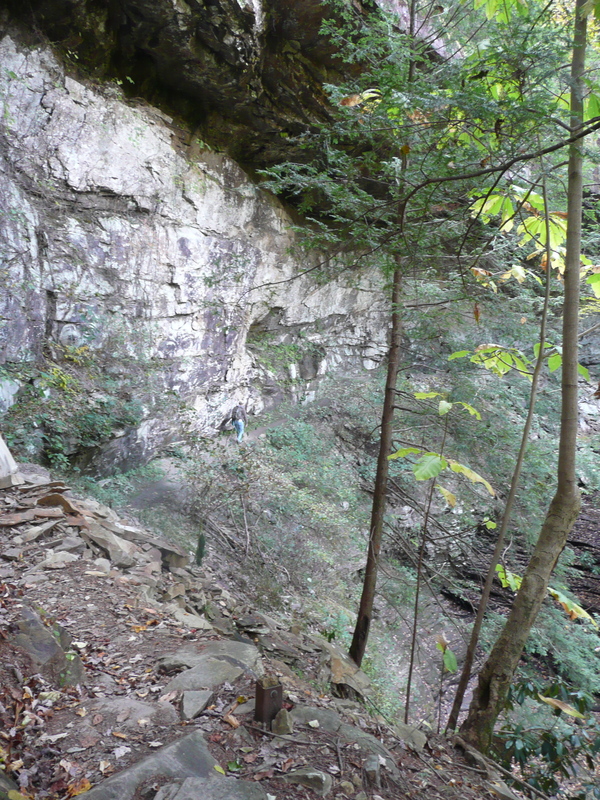 The trail traverses the edge of this cliff, which would have included “the spectacular triple waterfall of Rocky Mountain Creek” in a wetter year. 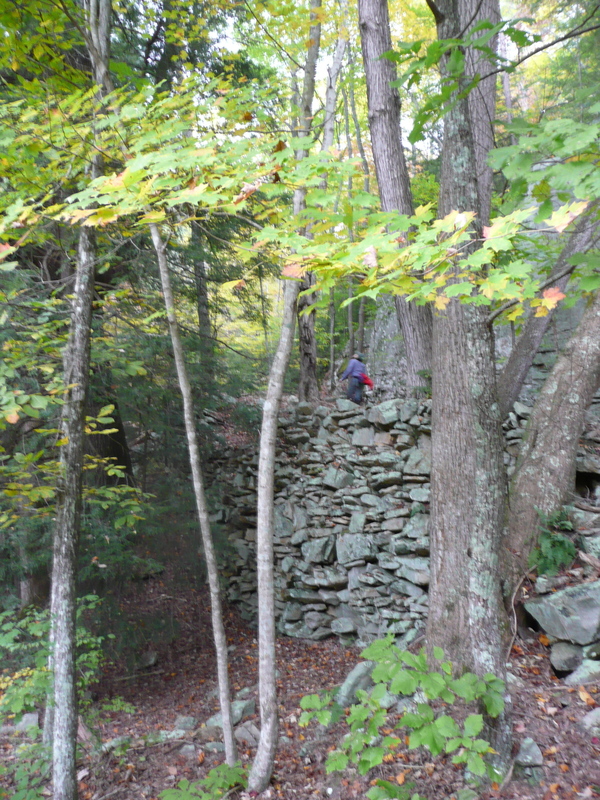 The author, on a trail switchback along rock wall terraces, built by early settlers to provide areas flat enough for grazing livestock! 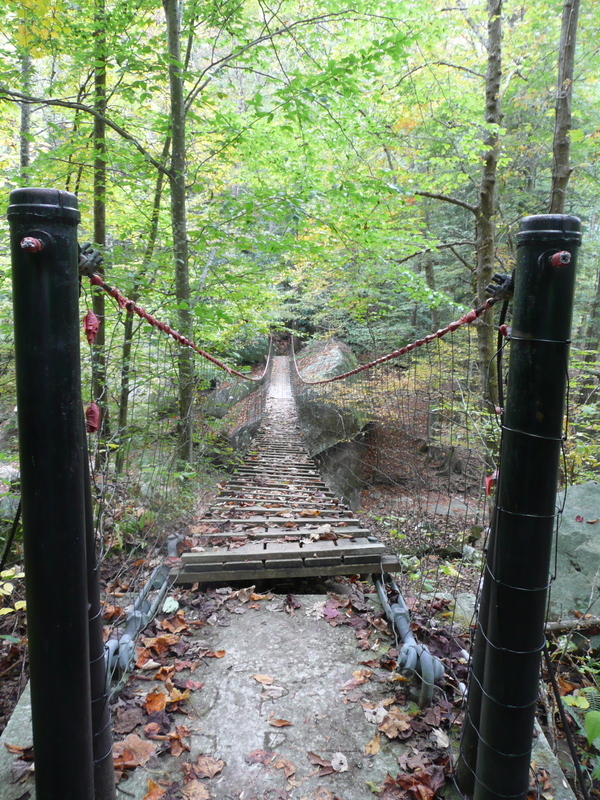 The loop trail we took crossed the “Gulf” (a local term for ravine or hollow) twice, on suspension bridges. Though the sun still shone, it got harder and harder to see our way in the evening, under the shadows of cliffs and trees. We crossed our last boulder field after the sun had set, but just before all of the light was gone. The last mile or so, though, we hiked in the dark, returning to camp to make a well-deserved supper by our headlamps! I found myself winding through the hill country south of Louisville as the sun began to set. There was no need to get off onto side roads – the scenery was amazing from the highway (and the same was true on the trip back north through Lexington). I was having trouble deciphering the Kentucky State Park campground information, so decided to spend the night at Mammoth Cave National Park. After a sub-freezing night among the oaks in the campground, I decided to wake up early, pack up quickly, and get in line for the first cave tour of the day. The second accidental detour of the trip was another wonderful experience! 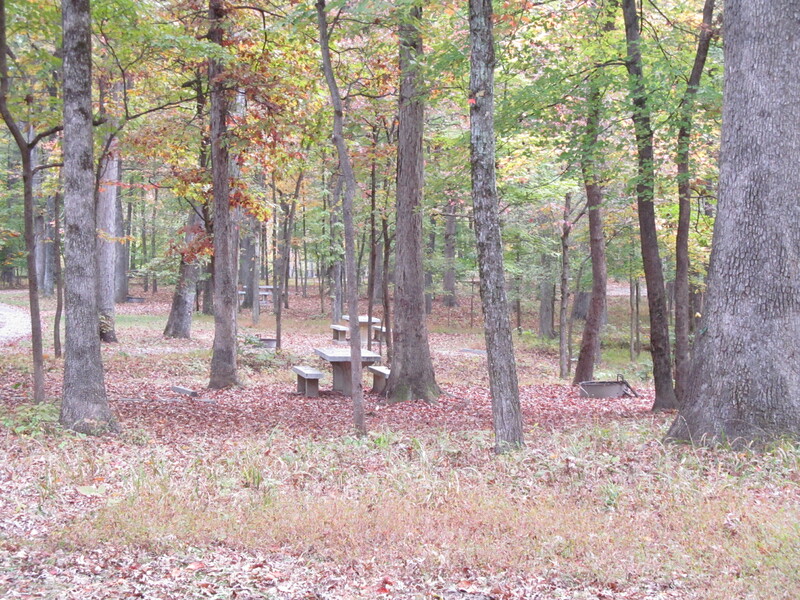 The scenery at the Mammoth Cave NP campground is lovely, but if it would have been busier, the quarters might have seemed a bit cramped. The park was busier than I would have expected for a weekday in October, and the tour I was hoping to take sold out with the customer in front of me. After chatting with the very helpful park staff, I decided on the “Historic” tour, which was also enjoyable. After my limited experience, I would recommend that you not visit the park as I did! Plan to spend two full days, and include some above-ground hikes and maybe two different cave tours, one each day. It really is an amazing natural wonder, and worth a little bit more attention! 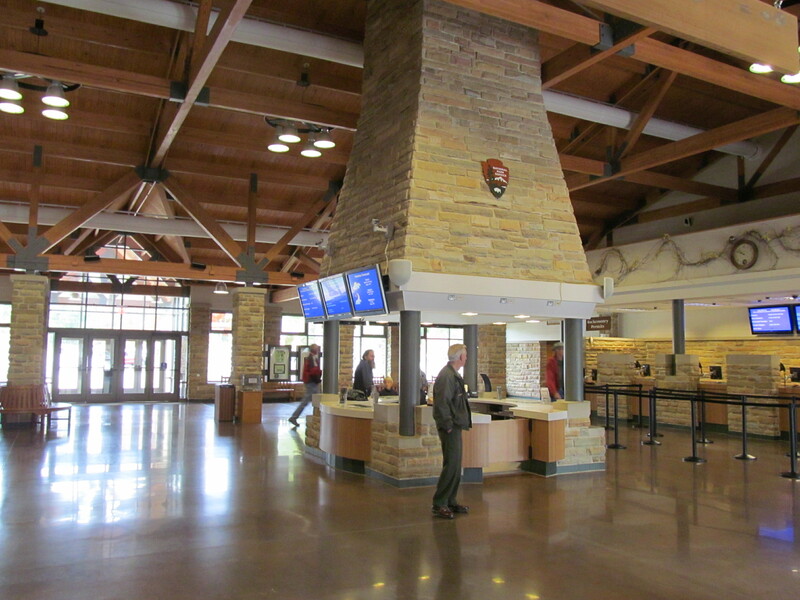 The lobby at the park was lovely – a brand new building that evoked some of the earliest National Park architecture. The line for tours curled around one side, while the other had a small museum so you could get a geology lesson while you waited. 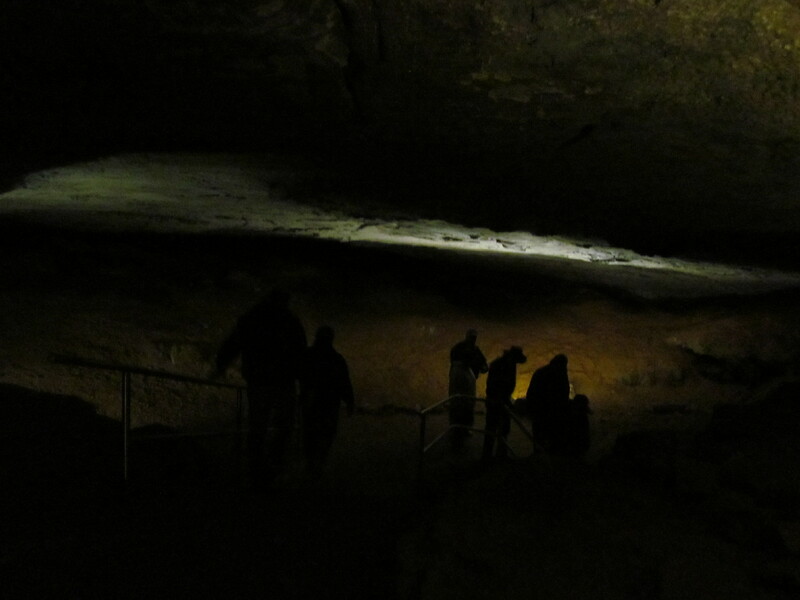 Mammoth Cave, unlike many of the other “show caves,” is largely a “dead,” or dry cave. That is, in most of the cave there are no showy stalactites and stalagmites, no pretty colors with minerals trapped in the calcite, or water dripping into pools. In fact, as the Historic tour showcases, the cave was dry enough to have had many uses throughout history. The cave was carved as a channel of the Green River passed underground, eating away at the limestone in the process. Over millennia, the above-ground river carved a deeper and deeper passage through its valley, and the altitude of the underground portion of the river decreased accordingly. This created several layers of passages, connected by vertical tunnels, and in the lowest of these, the river continues to flow today (in the cave, they call it the River Styx). As a result, Mammoth Cave is, with 365 miles of known passages, twice as long as any other cave in the world! 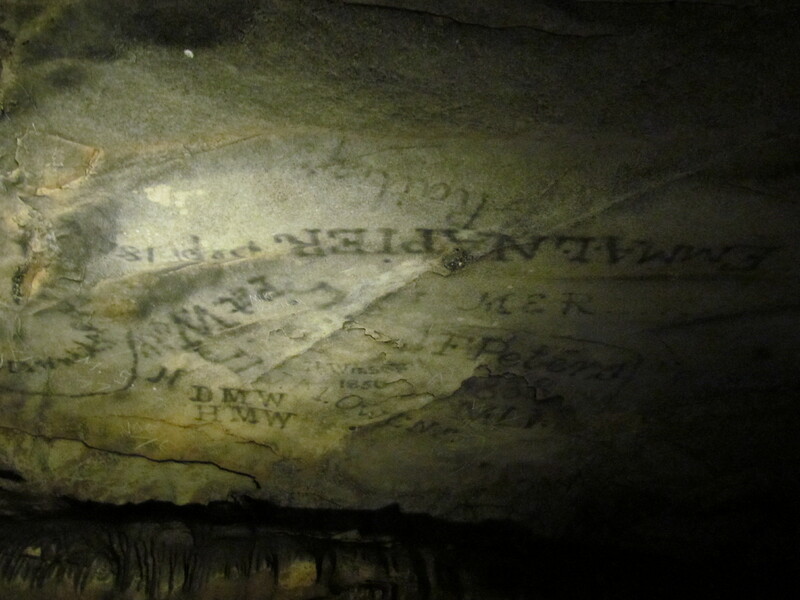 Early visitors to the cave had to tour by the light of flares, which they used to inscribe their names in soot on the ceiling! Members of my cave tour ahead, in the dim light. It is possible to take a hike through the oak- and maple-dominated upland to the point where the River Styx comes out of the ground and re-joins the main Green. 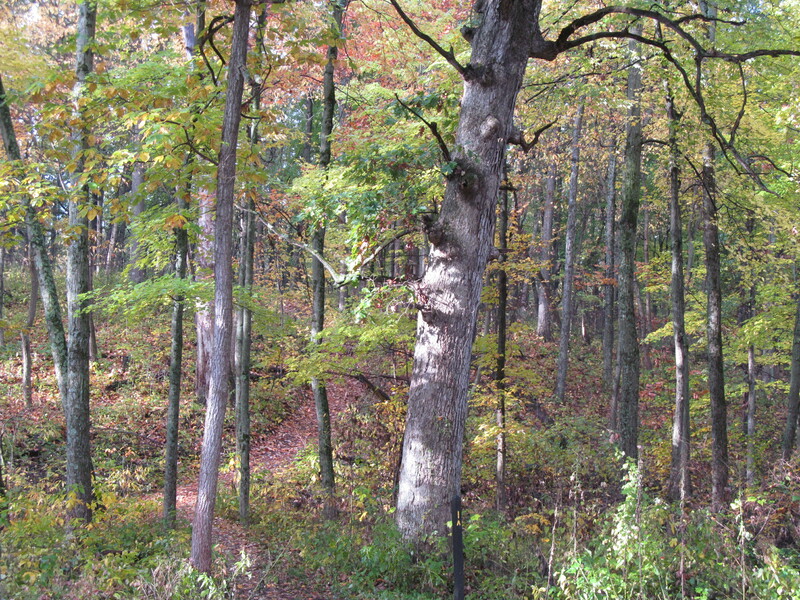 I wish I would have taken that hike, as well as one to areas of the park which contain older-growth forest. If you go, spend more time than I did, and tell me all about what I missed! I left northern Wisconsin after a half-day of work, hoping to arrive in northern Indiana before making camp for the night. I picked a spot on the map that was both far enough from the Chicagoland area to mean I was really on vacation, and that had a little campground symbol. This place was Tippecanoe River State Park, and it turned out to be just far enough out of urbanity that my eyes had trouble staying open by the time I got there. It also turned out to be a pretty cool stopover. Arriving in the middle of the night, this state park did not seem very promising, from an “experiencing nature” perspective. Although a Tuesday evening in October, the campground was quite busy. Busy with large RV’s, generators running because temperatures were near freezing, and decorated for Halloween. Apparently there is some sort of annual competition for the best Halloween decorations at this park. And by “decorations” they apparently mean copious lighted objects, string lights, flashing lights, and other light-type apparati in the orange-and-purple spectrum. Think your neighborhood’s obnoxious Christmas decorations… in October… in a campground. Not that appealing for those of us in a tent, but so be it. cool. 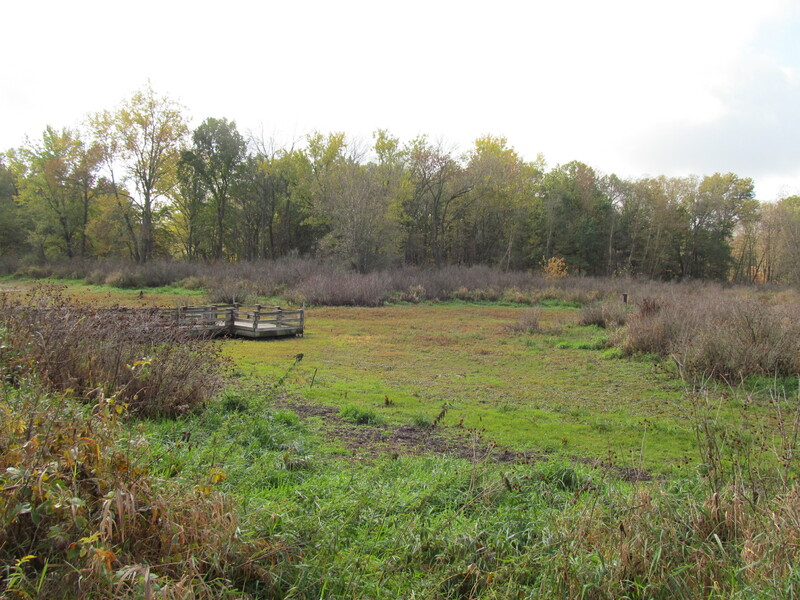 The park had a variety of ecosystems, from floodplain forests along the Tippecanoe, to a wetland impoundment, upland white oak woods, grassland, etc. 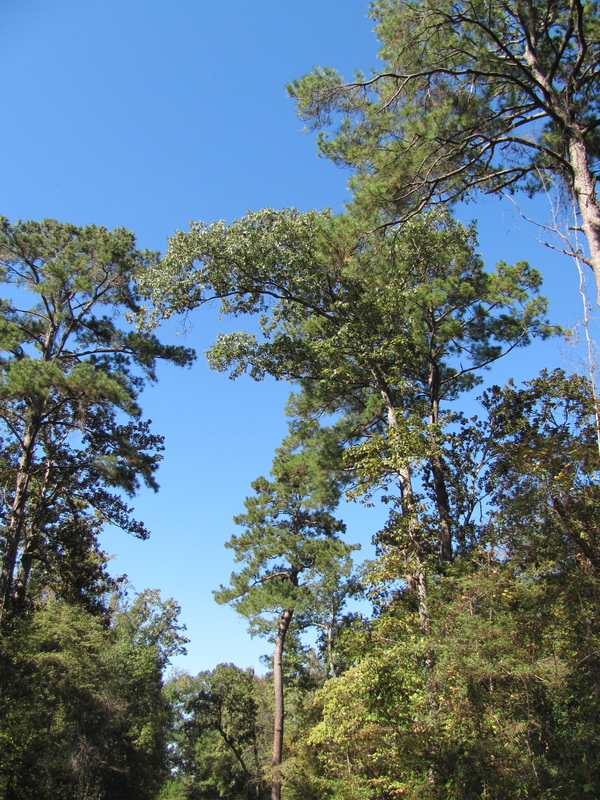 Most of my hike meandered through the oak woods, and even into a (very) small section of “barrens.” A few white pines grew here and there in the area, at the southern end of their range, and white oaks grew alongside post oaks near the northern end of their range. The barrens had many of the same trees and wildflowers that we see in sandy soils of central and northern Wisconsin – neat to see, a few hundred miles to the south. From a land management perspective, it was immediately apparent that the park staff were doing an excellent job of maintaining an open woods, and keeping invasive plants under control. Go Hoosiers! (Might be the first time I’ve said that). 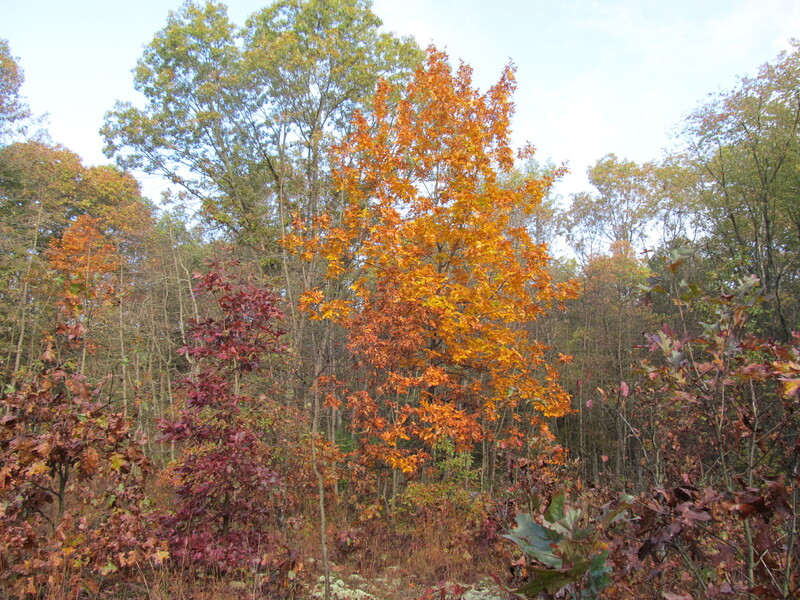 Barrens habitat and changing fall colors… several weeks behind northern WI! Wetland at Tippecanoe. They had drawn down the impoundment, so only shorebirds were using the mudflats… but I was a little too late in the year for shorebirds! 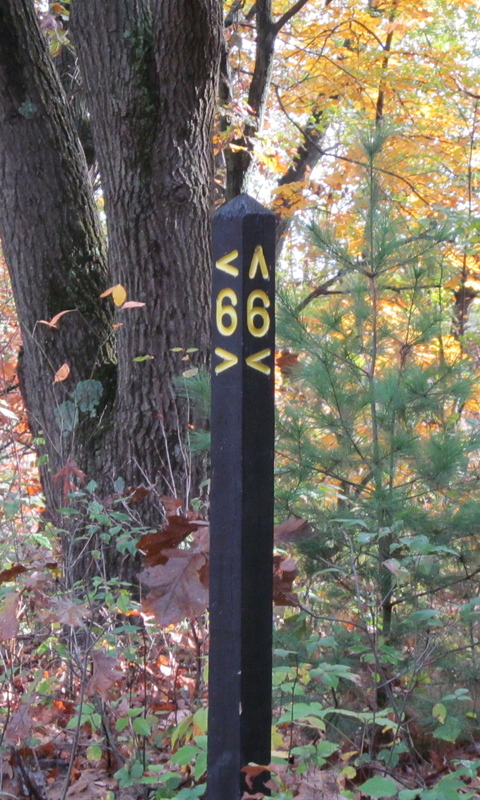 If walking around a labyrinthine trail system in deep sand looking at trees isn’t your bag, I’ve heard from a friend that the Battle of Tippecanoe historic site is also in that area. I missed it in the middle of the night, but if I had it to do over again, I would want to stop there. Check it out and let me know how it is! Congratulations to everyone who chose “Photo E” in the Poison Ivy quiz – you will be rewarded by many rash-free camping, hiking, hunting, and canoeing trips! For the other 37% of you… here is some more information that might help you in the future. First off, what were the other photos of? Photo A: Hog Peanut. This is a very common plant in woodlands – it twines around other plants, sometimes up trees, and often along the ground, creating a carpet of three-leaved plants. As a legume, its growth is characteristic of others in the pea or bean family – it has three symmetrical leaves, and fine curly tendrils at the growing end of the plant (maybe like the peas in your garden). It gets the name “hog peanut” from its tuber-like root that is edible… if you bother to dig up enough of them to make a meal! Photo B: Raspberry. A couple of you guessed this one – you’ll be missing out on some tasty treats this summer! Raspberries and blackberries often look like they have three leaves on a branch, sometimes 5, sometimes more. The leaves have toothed or serrated edges, though, the leaves are usually somewhat fuzzy, and the veins are very clear. The stalks usually have hairs and/or thorns on them, so you probably don’t want to get in a thicket of them without shorts on. The flowers are white, and the berries… well, they look like raspberries (in this case black raspberries)! The plant grows on long canes that together look like a bush, often between head- and waist-high, though the young stalks are shorter and especially blackberries can grow well above my head! Photo C: Trillium. This is a woodland plant that has a big, showy, white flower in the early spring – there are many different species throughout the Unites States; this one is a Large-flowered Trililum (Trillium grandiflorum). The “tri-” in its name refers to the fact that the flower has three petals and the plant has… you guessed it… 3 leaves! 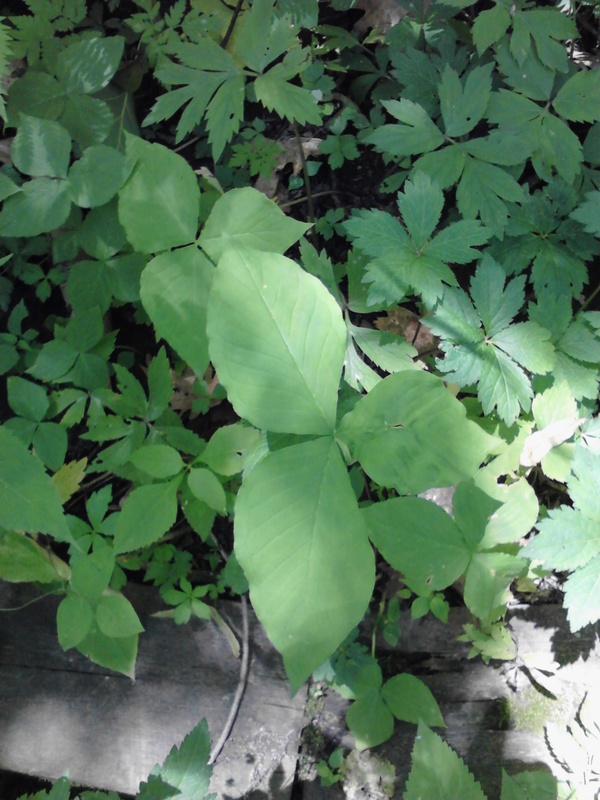 Its leaves are large like Poison Ivy’s can be, and the shape of the leaves is not always perfectly symmetrical. However, a few things set it apart: 1) if it is blooming, it will be obvious! Even if it is done blooming, you may be able to see where the flower came from – right in the middle of those leaves. 2) Trillium, being in the Lily family, has a few long veins, rather than many shorter veins off of a central mid-rib. 3) The leaves of most trilliums rarely appear glossy. 4) Each trillium plant is a stand-alone – just a stalk with three leaves at the top, and a flower. There may be several plants in a patch, but each one is distinct. 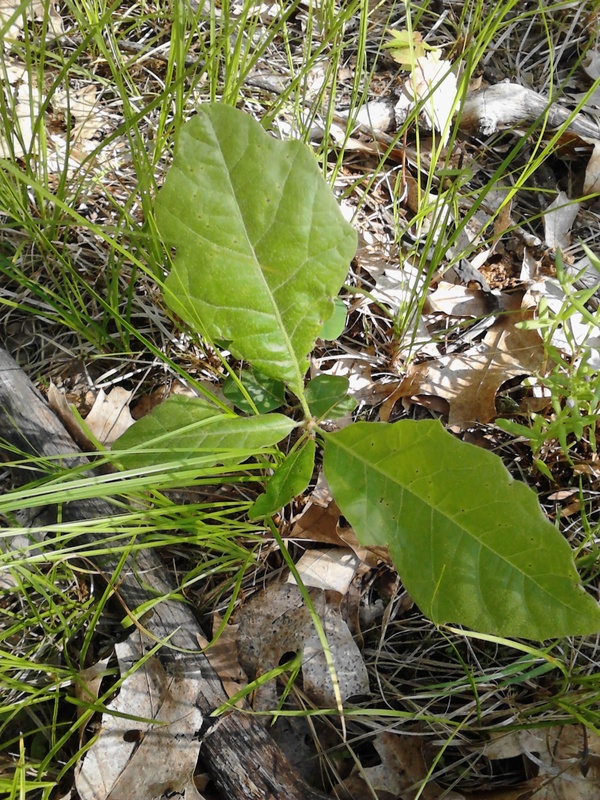 While it is possible to see Poison Ivy with just three leaves and a stalk, it is more common to see that grouping as part of a larger plant. 5) Trilliums are herbaceous – they wilt and die back after a few months of growth; Poison Ivy has woody stems and thus the stalks persist even when leaves are not present. Photo E: POISON IVY!! This really is Poison Ivy. 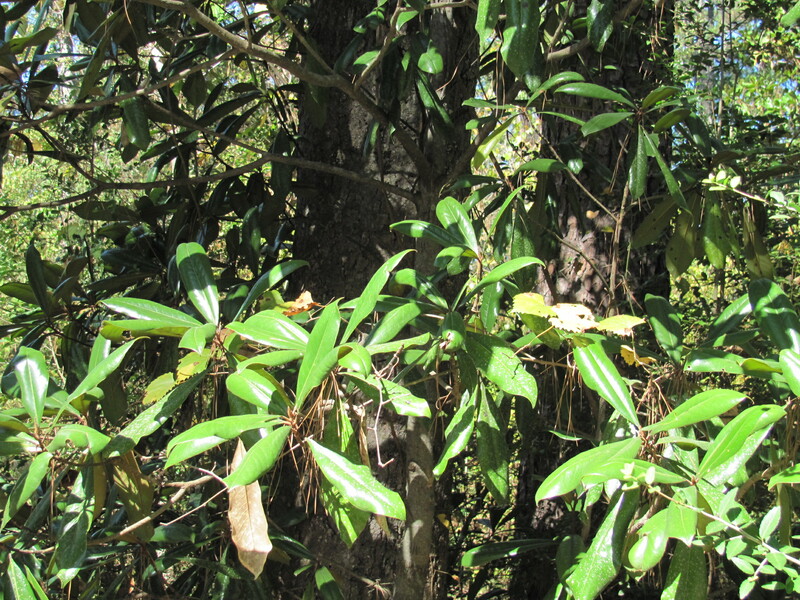 Note a few characteristic features: 1) Glossy leaves – that is the oil that is going to cause the nasty rash! 2) A-symmetrical leaves – often one half of the leaf has a smooth edge, while the other half has a couple serrations, teeth, or waves in it. On larger plants the leaves will sometimes look like a mitten – just a thumb and a finger showing, with the rest smooth. If there are several plants visible in one location (which there almost always are), it is likely that all of the leaves will look a little bit different. 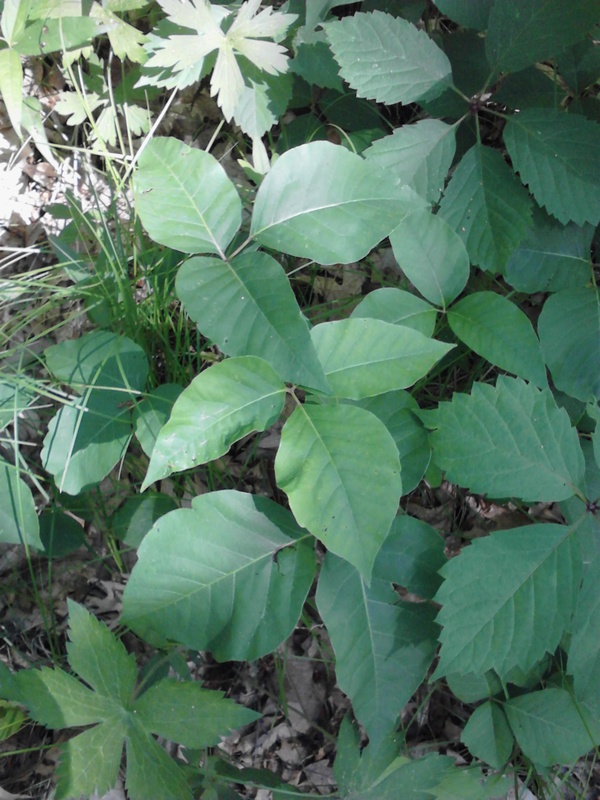 These leaves are the best way to ID poison ivy! 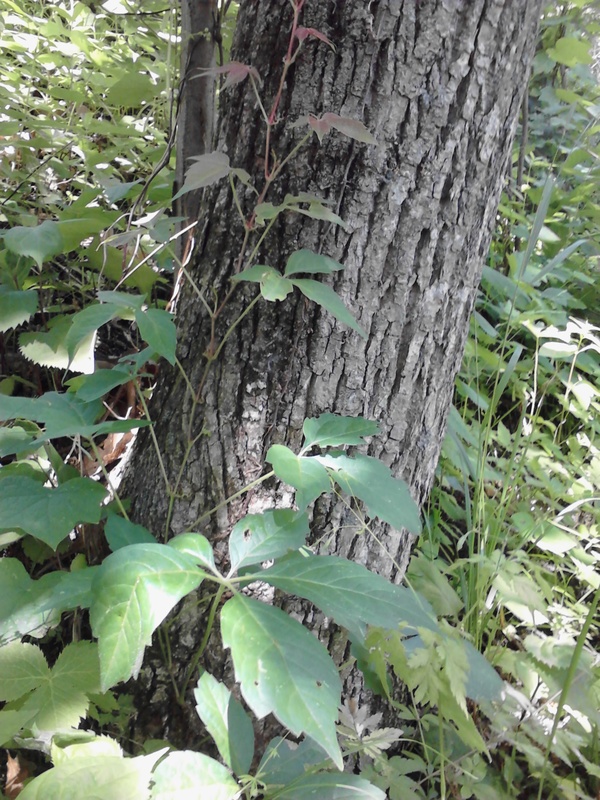 3) Poison Ivy has woody stems, but that is sometimes hard to tell. It can grow like a small shrub, like an individual plant, or like a vine, up a tree or neighboring branch. It doesn’t have to look like a vine, though. 4) Poison Ivy grows in a “rhizominous colony,” meaning that all of the plants in one area are likely connected by the same roots – this is what makes it grow up trees, and spread quickly once established. 5) As I showed in the previous post, PI has white berries and flowers – but you may not get close enough to be able to see that! 6) As I also mention, PI, though characteristically found in the woods, can also grow in open fields and riparian areas. Here in Wisconsin, our “western poison ivy” grows in open prairies, and the “eastern poison ivy” has done a great job of colonizing the floodplains of the major rivers. Photo F: Virginia Creeper. 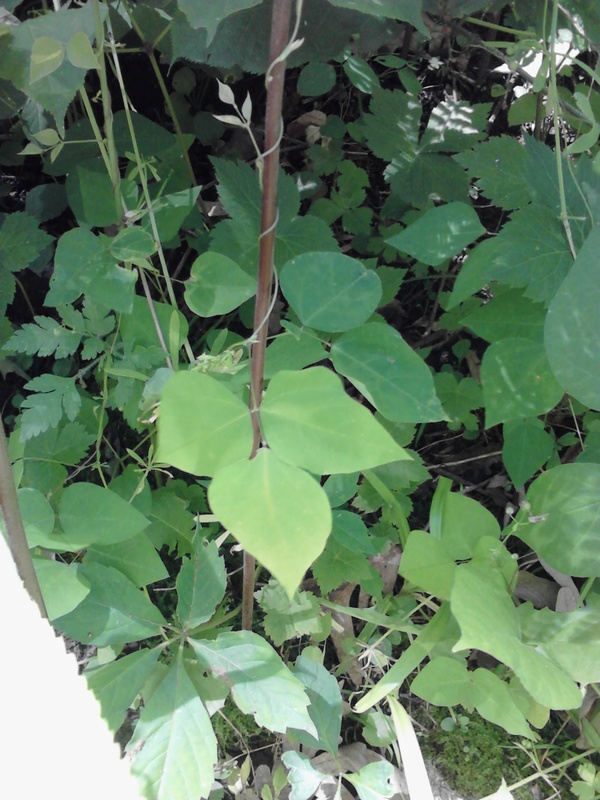 This is a common vine that grows in the woods. It has a woody stem, and you can see it twining around many of the trees around you, I’m sure. But…it has 5 leaves! So it is clearly not Poison Ivy. You were all smart enough to know that, and no one chose it in the quiz! However, I know some very intelligent people who have spent their whole lives avoiding the harmless Virginia Creeper because they thought it was the dreaded PI! Photo G: Desmodium glutinosum. This plant has a common name, too, listed in my book as Cluster-Leaf (or Pointed) Tick-trefoil. It is a relative of the Tick-trefoils that grow in western prairies, but this one grows in the woods. It has somewhat irregularly-shaped leaves, in groups of three (it’s another legume – they’re tricky! ), but it is yet another harmless wildflower growing around us. A couple things that set it apart from Poison Ivy are: 1) the flowers grow on a long stalk coming up out of the center of the plant; 2) While it appears that the leaves are in groups of three, those are actually the leaflets – there are 3 leaves on the plant, but each one consists of three groups of leaflets, emanating from the central stalk. If you can see this pattern, it’s a good bet it’s not PI; 3) This plant usually grows singly, not in large bunches, so the above pattern should be easy to discern. Did you find any Poison Ivy this weekend? Or avoid any near misses?! 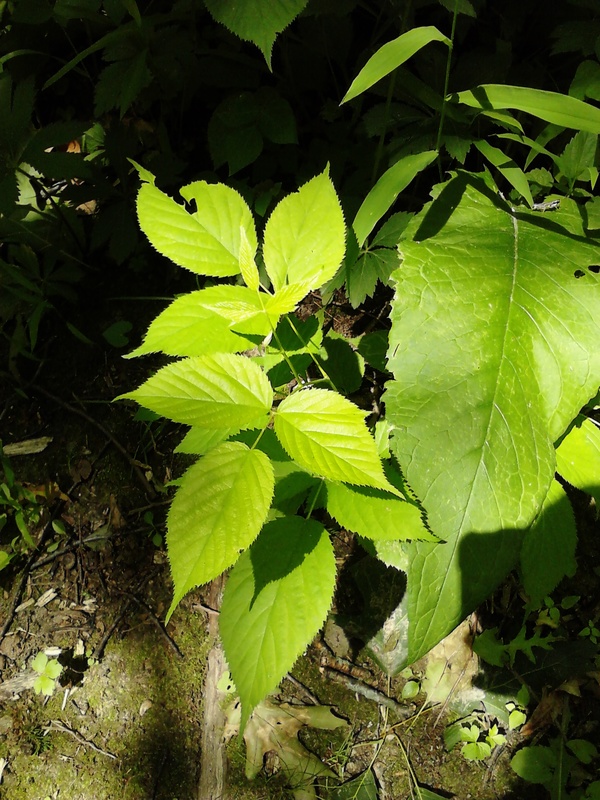 Have more tips for identifying Poison Ivy in the wild, or tricks for healing the rash once you’ve acquired it? Well, it’s definitely getting to be summertime, and that means one thing… Poison Ivy is everywhere! However, it has recently come to my attention that there are an awful lot of people who either have no idea what it looks like, or, maybe worse, actually think they can identify it but are looking at a different plant! So, as a public service, I’m going to let you test your poison-ivy skills! 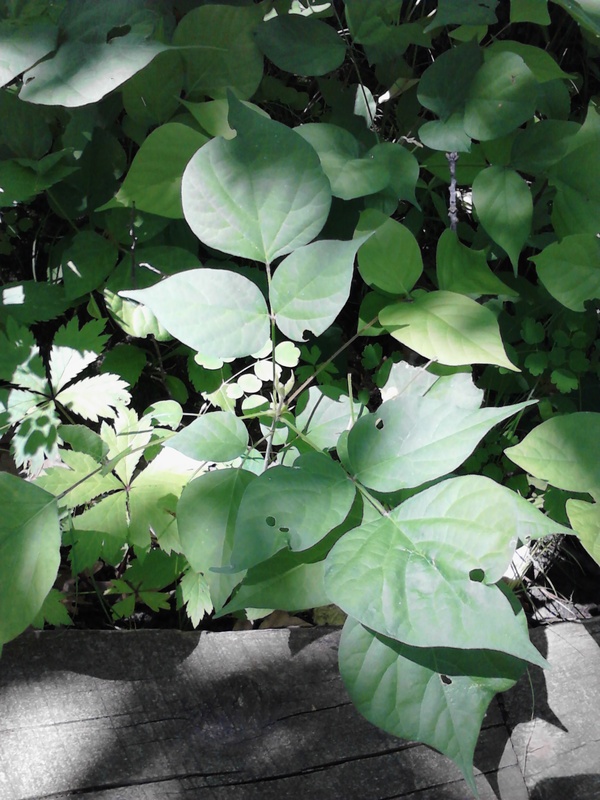 It will start today, with this short quiz, to see if you can pick out which one of these photos represents poison-ivy. At the end of the week, I’ll post a few more challenging photos, to see if you can pick poison-ivy out from a group of look-alikes all growing together. Whether you are out in the woods every day, like me, or you just like to take a Saturday morning walk with the family, or you’re planning an outdoor vacation, it’s a good idea to know how to avoid this plant! All of these photos were taken in Wisconsin, where we have 2 species of Poison Ivy: Toxicodendron radicans and Toxicodendron rydbergii. They look pretty similar, so you should consider them interchangeable for the purpose of this quiz. One or the other is present throughout most of the United States, at least east of the Rockies. Good luck! 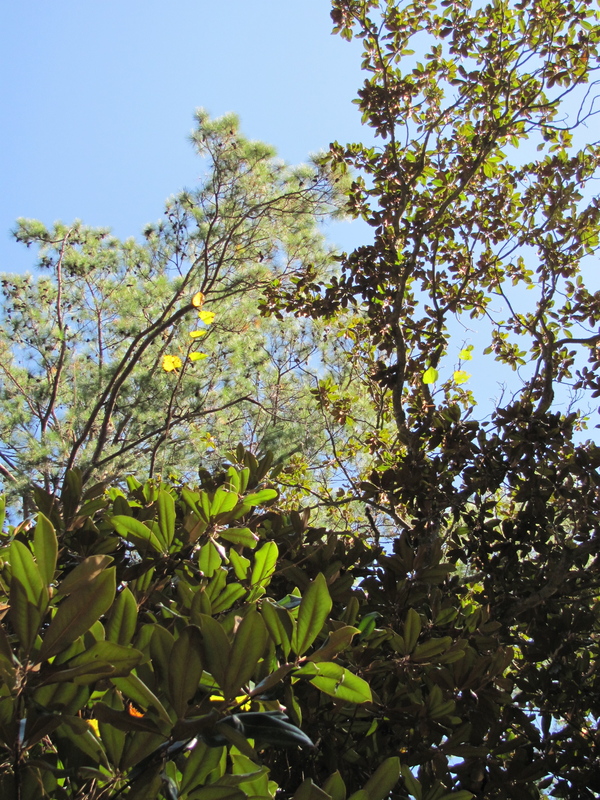 The Magnolia really made me feel like I was in "the south," as opposed to the southwest desert or coastal regions. 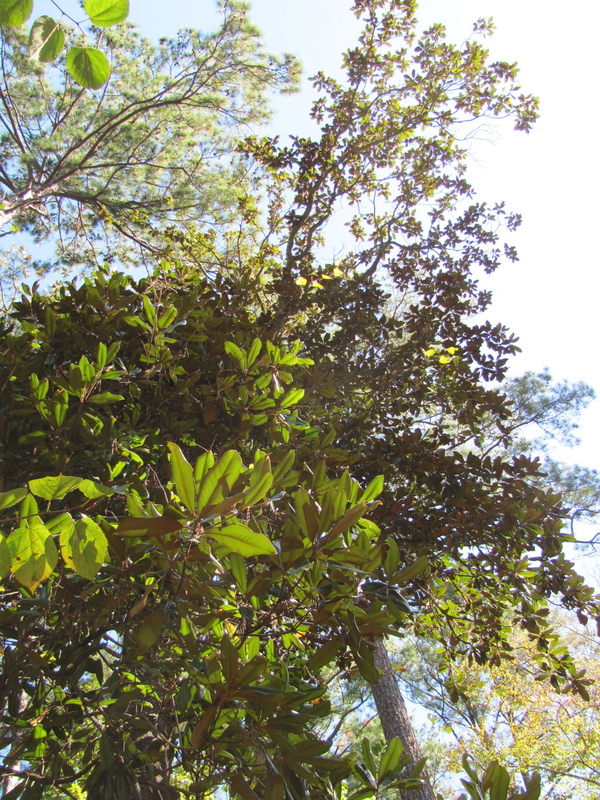 different species of pine trees but also magnolias, tupelo, sweetgum, cypress, and hickories, not to mention about ten different kinds of oaks – the Water Oak being one that I had never seen before. That was only in a short walk that I did right in Martin Dies Jr. State Park! An equal variety of herbaceous plants would have greeted me earlier in the year, and birds, fish, reptiles, and mammals of all sorts were hidden in the woods, swamps, and meadows around me. 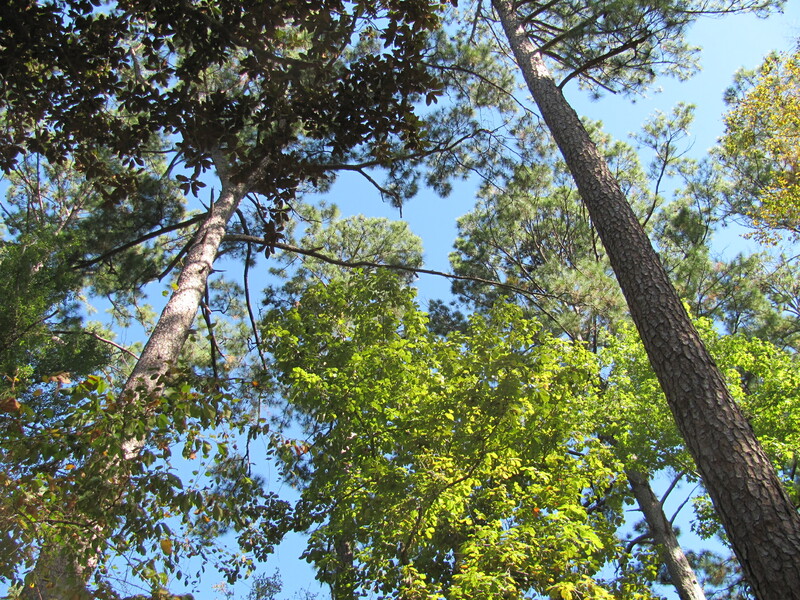 Because of this diversity, the Big Thicket is a little bit different from other National Parks and Preserves in that it is not a large block of land, but rather several separate corridors totaling about 100,000 acres within about 1800 square miles! Definitely plenty for everyoneto do… at least everyone who enjoys outdoor recreation. 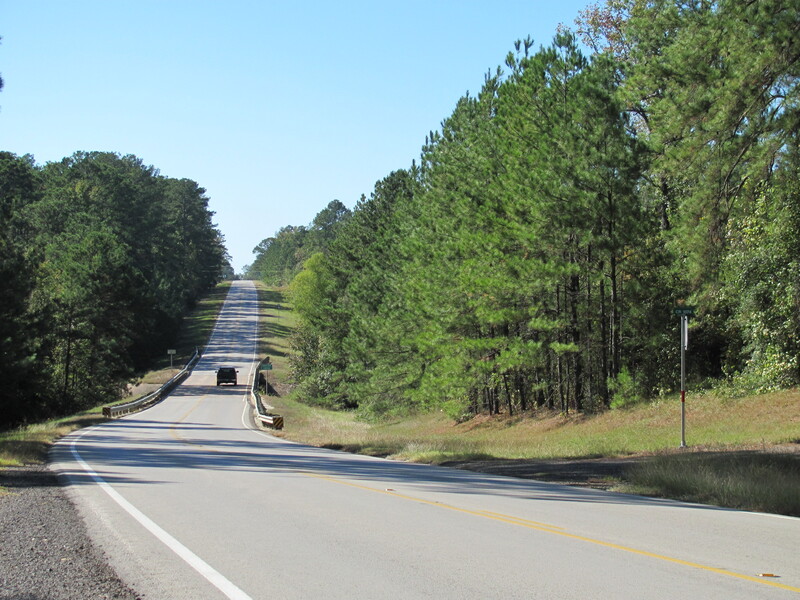 As I rolled out of north-east Texas into Arkansas, the pine-lined highway was a precursor to the Ozarks ahead.